Elizabeth O'Donnell, Associate Dean of The Irwin S. Chanin School of Architecture, finds herself in charge of steering the school through one of its most critical years by the circumstance of Dean Vidler's long-planned sabbatical. But, as revealed in this latest installment of the Meet the Deans series, O'Donnell's optimism, interest in asking new kinds of questions and her own personal history make her exactly the right person in the right place at the right moment. A Baby Boomer, O'Donnell grew up in Philadelphia with five brothers and sisters during the 1960s. (About her exact age O'Donnell only admits to being, "quite deep into my 50’s.") She spent twelve years attending parochial schools before moving on to Antioch College in the early 1970s. After her freshman year a student strike prompted her to exit the school and take time off. "I traveled back and forth across the country and worked on a farm for a couple years," she says. 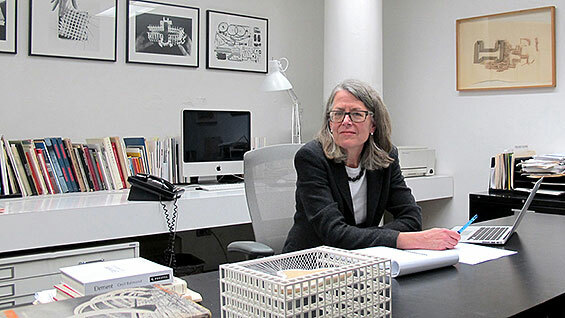 Eventually she made her way to Cooper Union's architecture school, graduating in 1983. She became an adjunct at the school one year later and served on many School of Architecture committees before she became Associate Dean in 2002, after 20 years in private practice as an architect. She lives in the East Village. Her only son, David, lives in Elmherst, Queens and attends Hunter College as a freshman. To "unplug" she reads, gardens and landscapes at her house in Columbia County, two hours north of the city. Did you always have an interest in architecture and buildings? I did not. It happened slowly. I recall an experience in high school when my interest was just a curiosity. I went to a “career night” and heard the talk given by an architect. And I have to say, the talk was so disinteresting and dispiriting. The speaker described the role of an architect as one who performs a series of incredibly mundane tasks. It took me four or five years after that to think, "Maybe what I heard about architecture at that presentation is not all it can be." At the same time, I loved to draw and I was a very good draftsperson. I could also be incredibly moved by architectural spaces. Can you think of an early example? I remember the church that I went to when I was young. It was a monumental space with beautiful ceilings and windows. It had beautiful sound and beautiful light. It had beautiful smells. You could feel that moving across its threshold transformed how you might think and maybe reconsider certain things that you otherwise took for granted. So it was a contemplative space for me to refocus, away from the quotidian issues of being a child and teenager. I always found that moment of transformation, of entering a building, very powerful. By the time I was applying to architecture schools I was beginning to understand that architecture could be an extraordinary fusion of the creative and the social, the formal and the humanistic. Why did you leave Antioch? In 1973, a student strike [over financial aid guarantees, among other issues] closed the campus for over a month. Many students wanted to continue to go to class but could not; the atmosphere on campus was tense with anger and recrimination. Lawsuits were filed to reopen the campus. The Court ruled against the strikers and ordered the campus reopened. The Ohio State police actually came onto campus to physically reopen the school buildings. At the time I was paying my own way through college. I had some scholarship support, but it felt untenable to take on additional loans to pay for my education while there was a possibility that classes could be cancelled for months at a time. It was a terrible time for a great liberal arts school with a great history. But, as someone who was financially responsible for my own education, it did not make sense for me to stay there. After I left Antioch, I traveled the US and Canada; I lived and worked in Denver, studied biology and art in Oregon, spent a month near the arctic circle in Canada and then farmed and kept bees in upstate Pennsylvania for two seasons. I had lived a completely urban life in one city for 18 years, and this was an incredibly expansive, enjoyable, open-ended time. Through it all, I was slowly turning back toward architecture. A friend in Oregon gave me Ian McHarg’s Design With Nature. Later I took a road trip to Boston to hear Buckminster Fuller speak at M.I.T. I remember that he spoke, without a break, for over four hours; it was remarkable. An exhibition of Louis Kahn’s travel drawings in a small New York gallery also made an impression on me. How did you end up studying at Cooper Union? What are your personal interests in architecture? I believe that architecture has the potential to be transformational, to enhance social interactions, to foster a sense of community and to provoke new ways of thinking. Architecture has an incredible capacity to mark and reflect history. It can contain and reflect our cultural aspirations. It can help us become better people. Who are the architects that you find most compelling? I transferred from the University of Minnesota to The Cooper Union because the architects who taught here were doing such inventive and radical work. For example there were architects such as John Hejduk, Raimund Abraham, Peter Eisenman and the painter Bob Slutzky teaching here. It was an incredibly interesting time of architecture working on parallel trajectories. There was the work of making architecture in the world and then there was the work of imagining a better world or a different world through architecture. Some architects were actually trying to reframe the very questions that were being asked in the course of making architecture itself. And many of those people were at Cooper. It’s both. The works being produced at the time were astonishingly beautiful. Beautiful drawings. Beautiful, optimistic proposals about how the discipline of architecture could approach questions of humanity, society and the important issues of its time. So the questions were beautiful. And the objects that were made in the course of asking those questions were also incredibly beautiful. You worked in private practice for twenty years. What did you learn from that experience? I enjoy the collaborative nature of architectural practice; it is an incredible pleasure to make a project with other people who bring their talent, skills and knowledge in support of your vision. I think that the architect not only creates the vision and design for a project, but sets the tone for its making as well. Part of the process is drawing the best work out of your team. I’ve also had great experiences helping artists to realize their visions, working with Tadashi Kawamata on his huge installation at the Smallpox Hospital on Roosevelt Island, and with Yoko Ono on an exhibition at the Whitney. You recently visited Dubai upon being asked to give a presentation at the World Energy Forum. What was it about? It was actually my second trip to Dubai. I was asked to present the work of the school as it addresses how architects might work toward a more sustainable future. I think it is an extraordinary moment for architects to become deeply engaged in the conversation about how our work can contribute to a more ecologically and culturally sustainable world. Habitation is one of the most basic of human needs. How do we as architects stay deeply engaged in that conversation so we can have a genuine impact on issues of not just environmental sustainability but of cultural sustainability: the sustainability of local practices, local arts and local knowledge? There seems to be a thread of social change and betterment running through your interests, history and ambitions. Is that fair to say? I think that's fair to say. I do not think of myself as a behaviorist, however. There was an idea in architectural practice and architectural education in the 70’s that there could be a direct relationship between a certain formal approach to architecture and a social outcome. I don’t believe that. It's the embodiment of the creative act, of an architectural idea, that can affect people. It's the chance to feel something sublime in the course of an ordinary day. What makes the school of architecture unique among such schools? We have a dedicated, distinguished faculty who are engaged across the full spectrum of our discipline: architects in practice, historians, theorists, those whose work explores fundamental conditions of architecture, and the top structural and mechanical engineers in the city. In the Design Studios of both the professional and masters programs, faculty work together in teams. Students benefit from having multiple voices guide their projects, and they work together as a class. So, our students create a very strong community; this helps them to work very, very hard and take real creative risks with their own projects. The masters and undergraduate students get to know each other through shared seminar classes, and this fosters an active exchange. There is an emphasis on analysis as integral to design at all scales: the analysis of an iconic house, a street, the city, and natural phenomena, such as the movement of glaciers or sink holes in Florida. Faculty set exceptionally challenging and inventive projects in motion each semester in studio, and then students do the same with their Thesis projects. Like the other two schools you must provide a plan for the long-term financial surety of the school. How is that going? Our profession, architecture, is an incredibly optimistic one. You have to be optimistic to build. So our faculty has been remarkable about discussing and developing academic programs that will broaden access to the unique qualities of a Cooper Union education, as well as other initiatives. We have discussed summer intensive programs for students thinking about pursuing the study of architecture, for example. We are also expanding our small graduate program. For the past three years it has had an average of about ten students in a class year. We hope to have twenty students for the 2013-14 academic year. The faculty are very interested in developing these programs regardless of the fiscal crisis. How do you keep Dean Vidler involved in the conversations going on at the school at this crucial juncture? Dean Vidler formalized plans for his long-overdue sabbatical in the spring, before President Bharucha announced his timetable for our proposals. But the Dean and I remain in close contact, having extensive conversations about developments at the school at least once a week. He understands exactly where we are in the development of our proposal and will review the final draft before it is submitted to the president. Dean Vidler has been very helpful in advising me about organization, and how to best focus my own efforts and the efforts and energy of our faculty and students. He’s been very supportive and excited about the results of our work. How do you imagine Cooper will be different in five years than it is today? I think it will be more active and more engaged with the broader architectural community. Up until this time the school has primarily focused on our matriculated undergraduate students. The professional program will continue to be our first priority; it’s the center of gravity of everything else we might do. Our graduate program has been very small but will expand. Summers will also likely be very busy from now on with programs that engage diverse groups of students. There may be evening programs as well, to better engage the professional community. Does your experience at Antioch inform your approach or feelings about the situation at Cooper? Institutions can be fragile entities. I think it is important for all of us to remember that the well being of The Cooper Union is in our hands. We need to shepherd this institution with intelligence, courage and caution, honoring its past and deeply considering what will be best for its future.